The Soleil d'Oc Campsite at Argentat, Corrèze (19), on the riverside in south Limousin. Look at the opening hours and dates of the reception of Airotel Soleil d'Oc. The pitches for camping and caravanning, motor home parking, and the hiring of different accommodation are accessible from 23 April until 18th November. Outside this period there is always someone to answer your calls, messages, your emails and your letters. 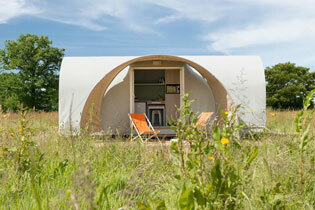 Don't hesitate to contact the Airotel campsite at the Soleil d'Oc, Argentat! - Heated, covered swimming pool, depth of 1.50m: open from 23/04 until 30/09 -> 9.00 am to 9.00 pm. Reception, postal service, a small library. 2 blocks of toilets and washrooms, with baby equipment and toilet for persons with reduced mobility. Restaurant, bar, pizzeria, take away: from 1/ 05 to 15/09 and weekends in the low season. Children's club in July and August. Entertainment in July and August. Our activities continue from the opening to the closing of the campsite of the Soleil d'Oc in Argentat. Multisports pitch with basket, volley, and handball. Petanque pitch with lighting possibilities. Playground for children from 3 years until 12 years old. Mini-golf with 18 holes (2€ per person per game). Ping pong tables with lighting for your matches (remember to bring your bats). Bouncy castle " the caterpillar" (4 - 12 years): July-August and weekends.